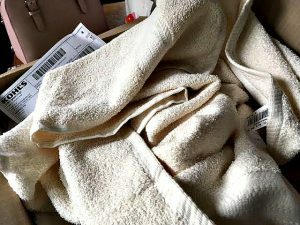 My $1.65 Kohl bath towels are here! These are the seven bath towels I bought from Kohl’s on the 11th using a combination of codes which brought my total down to $13.30, including tax! I was afraid they’d be very thin, but they’re pretty decent! Color is Pearl. 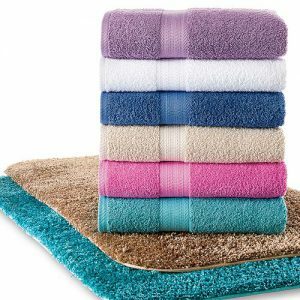 Bath Towels as low as $1.65 with stacked codes @ Kohl’s – today only! Kohl’s is having a big sale on, well, everything, but if you’re looking for bath towels on the cheap, buy them today! The Big One bath towels are on sale for $3.99 (from $9.99), stack promo codes TURKEY30 or BIGSAVE30 (for cardholders), HONOR10 or HONOR for $10 off $25 and NOV4FREE for Free Shipping. Non-cardholders can use promo code VETERAN for 15% off. I bought SEVEN bath towels — and I didn’t even have to drive! Kohl’s Final Clearance – up to 80% off! Shop the Kohl’s Clearance Event and save up to 70% – – choose Final Clearance items and your savings rachet up to 80%! What’s not to like? 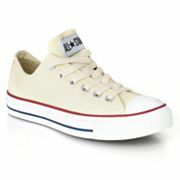 These Converse All Stars are half off – and they still have all sizes (up to 13 in men’s). Reader stops in to Kohls since she’d gotten one of those $10 off $10+ coupons in the mail and the kids needed back-to-school shoes. Kids were not thrilled with the selection, so she decided to just look around when she spotted this dress, fully lined, at 80% off – down to $10.80. 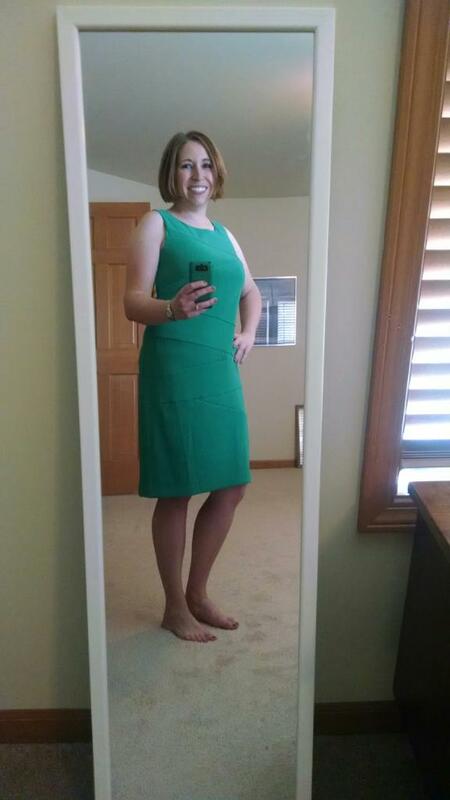 Brought it to the register to verify the price and walked out with a perfectly-fitting dress that can be worn dressed down for work or dressed up for a night out. Total OOP was 86¢…damned taxes! 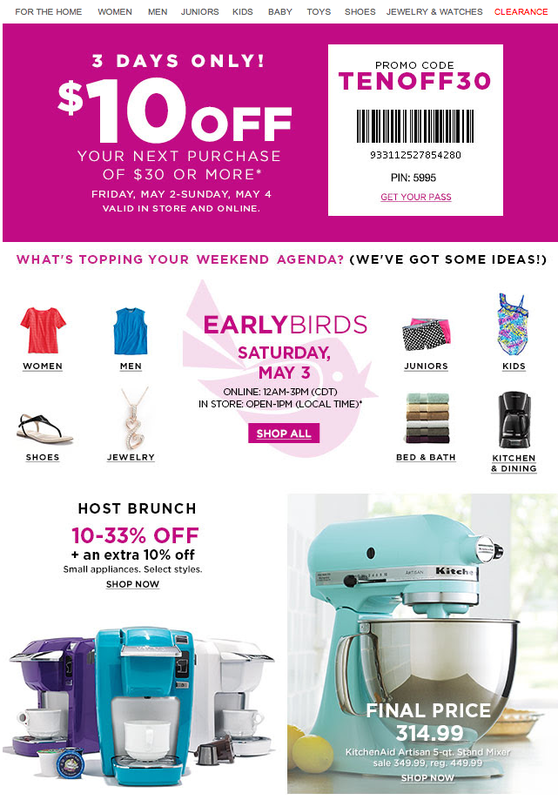 For those of you who were inexplicably outside enjoying the nice weather over the Memorial Day weekend, Kohl’s given us a 5-hour Flash Sale with a 20% promo code (TOMATOES) valid through 3 pm CDT! 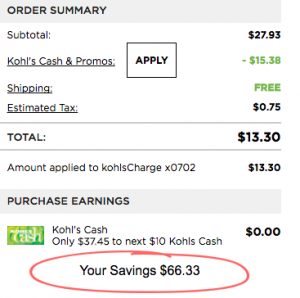 Grab any of these deals and save even more with Kohl’s $10 weekend promo code! Today only, save an extra 20% on home goods, fitness products, luggage…take your pick and take an additional 20% off at Kohls! Five hours only, from 10 to 3 CST. Kohls open now through Tuesday 6 pm! Check your local store’s ad – the Downers Grove store opened this morning at 6 am and will remain open through Tuesday 6 pm. Wow! Check here for information on other locations. Save extra 20% @ Kohls & get free shipping! This Crock-Pot was originally $59.99, now it’s $24.99. 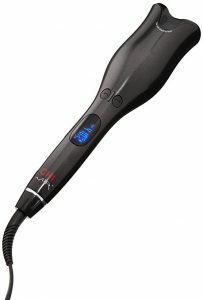 Use promo code CYBERSAVE and it’s down to $19.99!